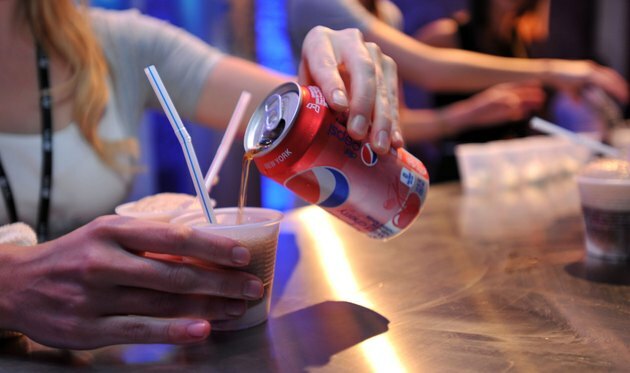 Does Diet Pepsi Make You Gain Weight? Switching to a diet soda can help reduce your caloric intake, especially if you're already a soda drinker. Most diet sodas, like Diet Pepsi, contain no calories, so drinking a can or two won't increase your caloric intake by itself. However, there's some indication that diet soda can increase your chances of weight gain. For some people, drinking Diet Pepsi or another artificially sweetened beverage can lead them to consume more calories, according to a study from Johns Hopkins University, published in the March 2014 issue of the "American Journal of Public Health." But it's not the soda itself that's to blame. It's what's on your plate. Switching to a diet soda can make it much easier for you to rationalize those indulgences. You can justify eating more of what you want because you're no longer getting calories from soda, which can lead to overeating and subsequent weight gain. Drinking artificially sweetened beverages may also set up a caloric expectation in the body. Any time you eat or drink something sweet, it normally contains calories. But Diet Pepsi is unable to fulfill what's anticipated. The body compensates by stimulating your appetite, causing you to feel hungry, according to a study conducted at Purdue University. This, too, can cause you to overeat and gain weight. Another potential cause for the weight gain involves your metabolism. It appears that artificial sweeteners, like those used in Diet Pepsi, have no affect on the core temperature of the body, according to a 2008 study in "Behavioral Neurosciences." Any time you eat or drink something that contains calories, the body responds by increasing its temperature, which triggers the metabolism. When this fails to take place, it could slow the metabolism and result in weight gain. Further studies are necessary to determine actual effects. Regardless of whether or not you drink diet soda, gaining weight revolves around calories. If you consume more calories than your body burns, you're going to gain weight. A pound of fat is equivalent to 3,500 calories, so a surplus of this amount causes you to gain a pound of weight. However, the same can be said for weight loss. If you consume fewer calories than your body burns, you lose weight. A deficit of 3,500 calories equates to one pound of fat loss. Based on the evidence, Diet Pepsi itself doesn't cause you to gain weight. There's nothing in it that has a direct impact on your caloric consumption. It can, however, encourage overeating for some people, which may lead to weight gain. TIME: Can Sugar Substitutes Make You Fat? Can Drinking Diet Coke Cause Depression?